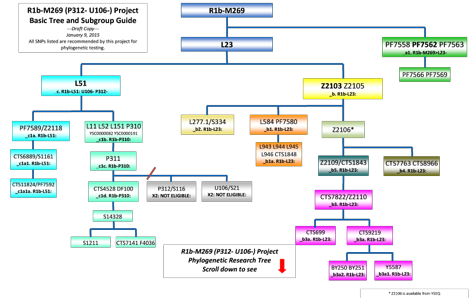 Since most of our participants are in the R1b-M269 [Formerly R1b1a2] family I want to familiarize you with our phylogenetic tree. Al of us will share the mutation M269 and will consider it our common ancestor. A large group sharing a common ancestor is called a Haplogroup. The inevitable polymorphisms of nucleotides would further divide us into subclades or haplotypes. In genealogy this is your family group leading to most recent common ancestor. This list, courtesy of FTDNA, is not all inclusive. Updated in January 2015, it is a good up to date representation of the major SNP’s downstream of R1b-M269. You will note it includes the newly discovered "third brother" of P312 and U106 known as CTS4528 or DF100. 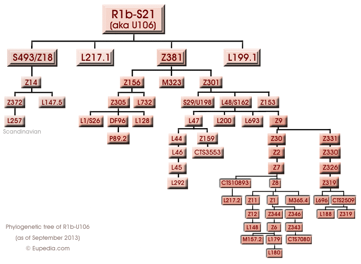 There are so many SNP’s downstream of P312 and U106 they will be shown on a separate chart. Comparison of your sequence to others may give you a clue when ordering SNP tests. There are variants to all SNP’s. Fortunately, there are several folks who have blazed the trail and have positive tests for each SNP listed below. You may not be an exact match with someone at DF27 or U152 but you may be in parameter for testing at these SNP’s. As discussed previously, a 1 step distance on fast changers may still make you eligible for testing. You will notice non positioned "private markers" in this tree. These are believed mutations within the last 500 years. A private marker is when only one individual or family has been identified. These are monitored as family and then branch groups may emerge in the future. 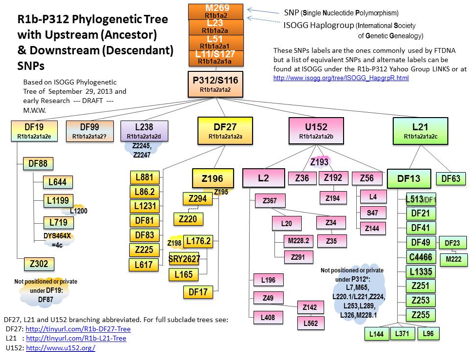 As you go further down the phylogenetic tree it becomes more difficult to separate and determine terminal SNP’s. For example, an individual testing positive at Z2 may next choose both CTS10893 and Z8 to ascertain which direction to go. A negative test on both should then test Z7. If the test at Z7 is also negative the participant is Z2 terminal and noted Z2*. A positive test at Z8 may assume Z7 positive and again compare sequences for testing. If no revelation is discovered through comparison, I would recommend the participant to test the lowest level of options presented. In this case it would be L148, Z6 and Z343. The reason is this rule out options downstream with a negative test. It also assumes positive upstream if the test is positive. I would only test M356.4 if micro alleles are present in my test results. Micro alleles are additional markers at loci such as DYS393 and more commonly DYS464. The normal at 464 is four values but up to seven have been observed.